Constrictor presents GOSH! The Intelligent-Listener's Guide To 90's Rock Music. Starring: 16 Bands on CD! Distribution: EFA/Hamburg, Germany. Red Rhino, York, UK. Annotation: The release is called "GOSH! 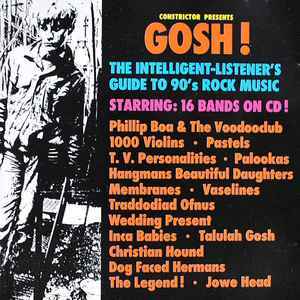 THE CD-COMPILATION" on CD and back-cover but "GOSH! THE CONSTRICTOR-COMPILATION" on spines.